This past September, we shared a story about Betty Blume, a military mom who has been sending the comforts of home to various troops in Afghanistan. Kafka Granite has continued to cover the shipping costs of these care packages, and now Betty has asked to publicly express her gratitude in light of the holiday season. The following is a message from Betty and her husband, Larry, as well as two of the many gracious recipients currently serving in Afghanistan. Kafka Granite will continue supporting this good cause and we encourage you to join us. Please contact us if you are interested in spreading holiday cheer to our soldiers overseas! 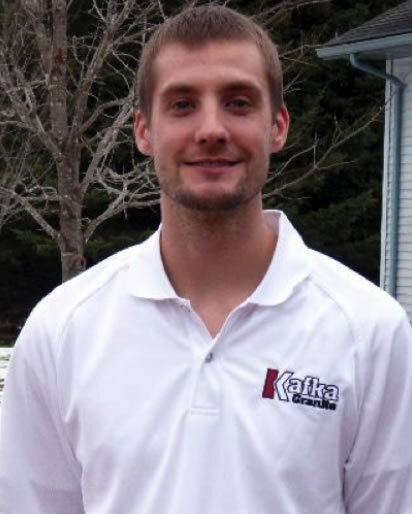 Jeremy Bores joins the sales team at Kafka Granite: Kafka Granite is proud to introduce Jeremy Bores, the newest member of our sales team. Jeremy graduated from the University of Wisconsin-Eau Claire in 2009 with major in Marketing and a minor in Information Systems. He since has gained sales experience while working for both Bauer Built Tire and Marshfield Doorsystems. Jeremy has known the Kafka family for many years and shares common values with Kafka Granite, making him a great fit for our team. “I feel very privileged to be a part of the Kafka Granite team. I see Kafka Granite as thriving small business that will continue to exceed expectations for many years to come,” Bores commented. Jeremy will be working primarily from our Mosinee office. You can contact him directly at jeremy@kafkagranite.com. Wisconsin Salt Solutions provides anti-icing and de-icing products: With winter upon us, tis the season that counties and municipalities throughout Wisconsin turn to Wisconsin Salt Solutions to keep their roads free of snow and ice. Wisconsin Salt Solutions is a division of Kafka Granite‘s sister company, Kafka DustBuster Plus. Wisconsin Salt Solutions provides both liquid Calcium Chloride and liquid Magnesium Chloride, which can be applied either before a winter storm in order to prevent ice, or after the storm in order to expedite the melting process. These products will melt snow and ice at a temperature as low as 20 degrees Fahrenheit. In addition, by adding 20% IceBite (a de-sugared sugar beat molasses) to the solution, the melting process is even more efficient. With the addition of IceBite, the melting point drops significantly to well below 0 degrees. Due to IceBite‘s residual effect, the product stays on the road longer, decreasing additional applications. This product also assists in breaking the bond between the road surface and the ice/snow, making plowing easier and more efficient. Finally, this organic and environmentally friendly product is a natural corrosion inhibitor. With the addition of IceBite, corrosion is reduced by 50-60%, preventing rust on vehicles and metal in bridges. These products are available in 4,500 gallon tankers or 250 gallon totes. Are you interested in improving the winter driving conditions of your roads? Contact John Meyer for more information. On behalf of Kafka Granite, we would like to thank you for your continued support of our family business. We wish you a very happy holiday season and a prosperous new year.